When preparing for a hunting trip, I start by considering the quarry I’m after and the shooting conditions likely to be encountered. Here''s my list. There are several styles of packs to choose from, and I’ve gone through a number looking for the ones that best serve my purpose. I’ve come up with two favorites, the first is a messenger style pack that has a single strap worn across the chest bandolier style and the second is a larger pack of conventional style. Both have small pockets for external storage and easy access to frequently used items such as range finder, binoculars, and ammunition. 3. Food and water: Granola bars, protein bars, or trail mix and a liter of water are standard in my pack. 4. Emergency kit: A full blown emergency kit is a good idea when venturing into particularly rugged areas. A compass, GPS, and cell phone are packed as insurance if I get temporarily turned around as well. 5. Extra knife: I’ve had many occasions in the field where I’ve lost or forgotten my belt knife and this backup has saved the day. 1. Tool kit: Things can go wrong that are exclusively airgun related, such as a blown O-ring or dirt in the fill valve. I carry a small tool kit with extra O-rings, Allen wrenches, a couple of small crescent wrenches, a screw driver set with slotted and Philips heads, a set of pliers, a roll of Teflon tape, and extra connectors and fill probes. 3. Variety of pellets: The reason for this is that no matter which rifle I take along, if I run out of pellets, lose, or forget to pack them (all of which I’ve done more than once), my hunt is not ruined. If you only use one gun or one caliber this will simplify what needs to be packed, but at any rate it adds only a few ounces that are well worth the effort when you need them. 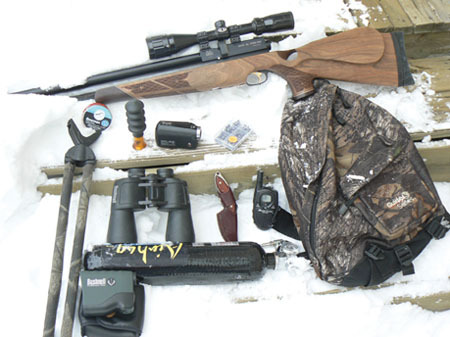 Everyone has variations; but if you are prepared to stay healthy and comfortable in an unexpected situation, have all the gear on hand to make repairs in the field, your airgun hunting experience will be hassle free. Do you have anything specific that you like to carry into the field? Let us know in the comment section below.